Guiyang, capital of Guizhou province has come in 10th in a list by the Ministry of Environmental Protection detailing the air quality for 74 cities across China in March. A cross country race was held in Zunyi in Guizhou province on April 16 to mark the Red Army's Long March that finished 80 years ago. 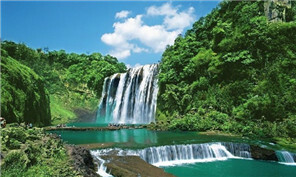 Southwest China's Guizhou will host the 10th International Forum on China Hotel Brand Development on April 21 to 22. 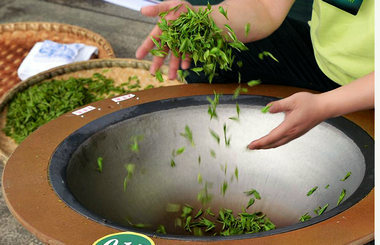 A contestant takes part in a competition of handmade green tea producing technique during a tea cultural festival in Yuqing county of Zunyi city, Guizhou province, April 18. Expedition members work within the Miao Room Chamber, China's largest cave chamber by volume, in Ziyun county of Southwest China's Guizhou province, April 14, 2016. 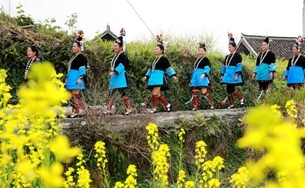 Spring blooms bring visitors to Guizhou.Guizhou's flowering fields lure visitors to fly kites and experience its ethnic culture. A French documentary on the Miao community living in Guizhou province, southwestern China was seen by 5.2 million viewers.